“We did it again!” beamed coach Craig Nicol after City of Edinburgh Kings produced more heroics to retain their Scottish Basketball Play-Off title. With barely ten seconds left, the holders trailed Falkirk Fury 73-71 in Saturday night’s final at Oriam having been ten points adrift at half-time, but Kings refused to panic after snatching victory from the jaws of defeat against Boroughmuir in October and in the Play-Off semi-final at league champions Dunfermline. Konrad Kantorski was the key figure in both comebacks and worked his magic for a third time, draining an ice-cool three-pointer to give Kings a dramatic 74-73 win and a record fifth play-off title. “Konrad’s been outstanding for us and he came up big again,” smiled Nicol. “We were down by 15 points at one stage, but we kept chipping away at their lead. You’d ideally be well ahead, but we’ve come from behind and won it at the end several times before. Caledonia Pride head coach Bart Sengers had a less enjoyable weekend after the Edinburgh pro side slumped to an 11th defeat in 12 games in 2019. 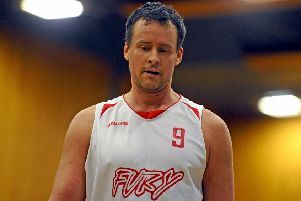 Saturday’s 63-49 loss to mid-table Oaklands Wolves in London was another blow to their slim hopes of reaching the play-offs. Pride beat Wolves in October and took an early lead on Saturday, but they fell 12 points behind during a disastrous second quarter. Despite cutting the deficit to four, they then conceded the first eight points of the final quarter. Alix Henderson top-scored with 13 points, in-form Sian Phillips added 12 rebounds and captain Hannah Robb led by example, but star player Tia Weledji was sorely missed after injuring her Achilles tendon last week. Pride’s top scorer has gone to America for treatment and won’t feature again this season. She is unlikely to return to Edinburgh next term after completing her Masters degree and expressing a wish to play professionally in Spain. “She’s been great for us and we’re very thankful for everything she’s done,” said Sengers.